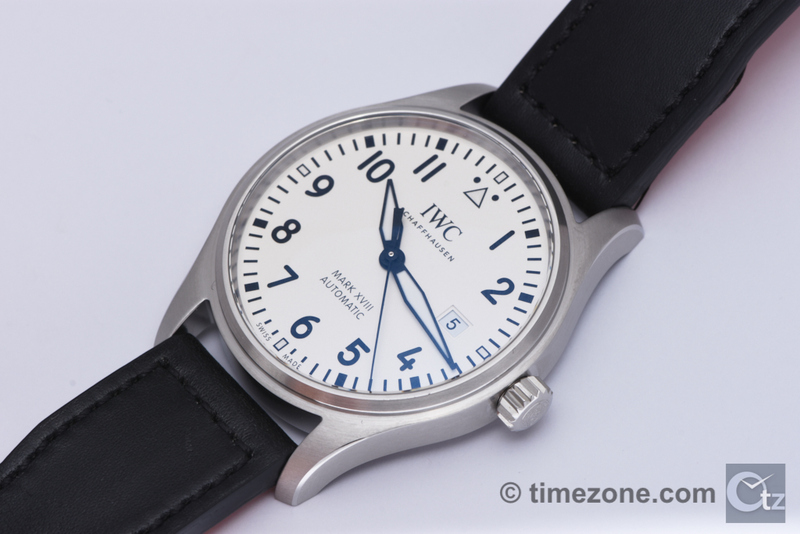 IWC celebrates the 80th anniversary of its first Pilot's Watch that launched in 1936. 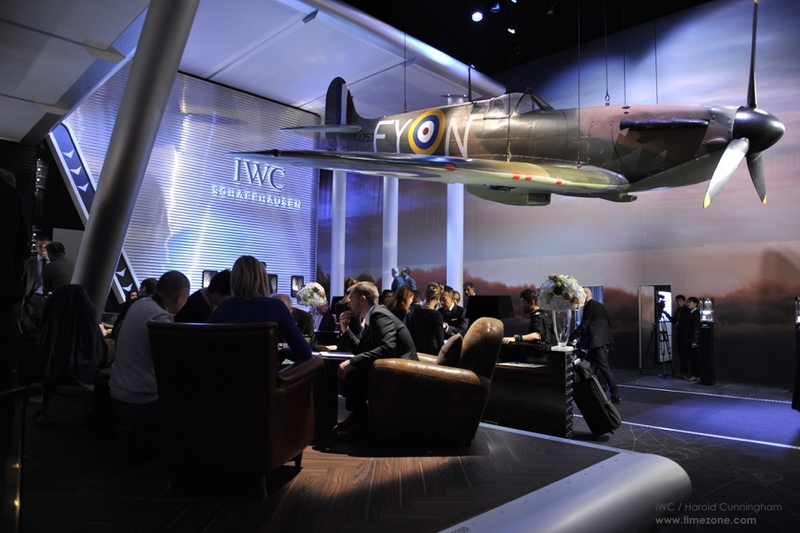 To celebrate the milestone, IWC launches its biggest Pilot's Watches collection ever under the banner of this year's theme, "Come Fly With Us". "Many of us have shared a fascination for aircraft and flying since our childhood years. 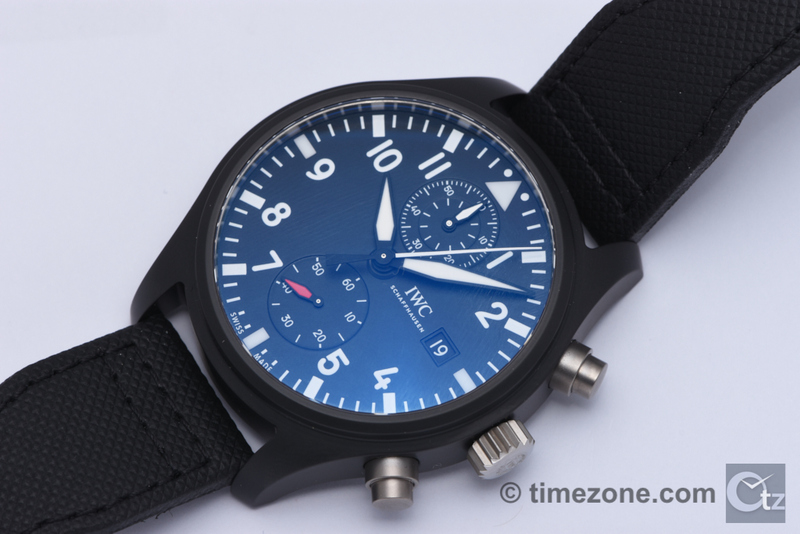 IWC's Pilot's Watches bring this passion to people's wrists and are popular with watch devotees all over the world," says Georges Kern, CEO of IWC Schaffhausen. 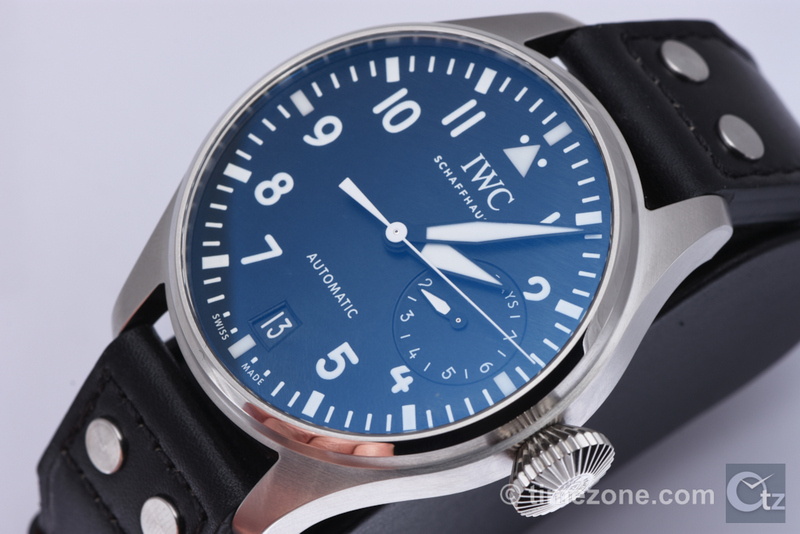 With their characteristic dial design and technical highlights such as a soft-iron cage to protect the movement against magnetic fields, IWC also shipped a genuine Supermarine Spitfire from Manchester to Geneva to set the 1930s atmosphere that inspired the new Pilot's Watches collection, including the Big Pilot's Heritage Watch 55 (Ref. 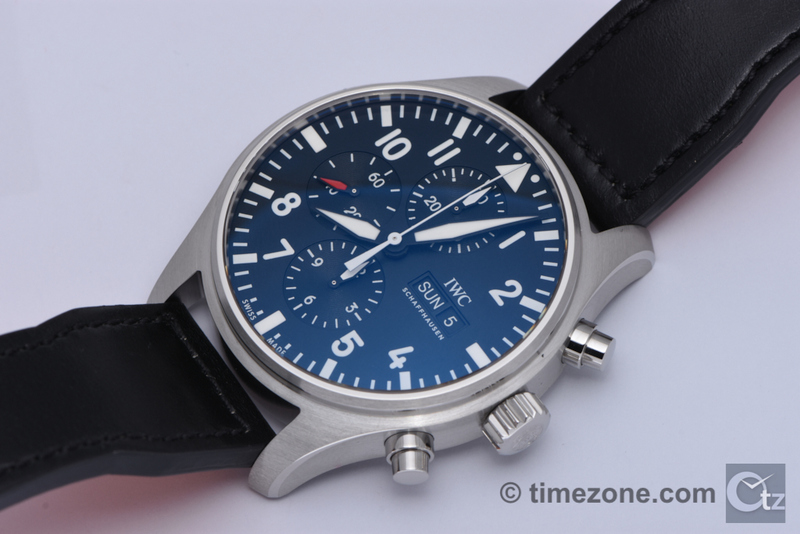 IW510401), the Big Pilot's Heritage Watch 48 (Ref. 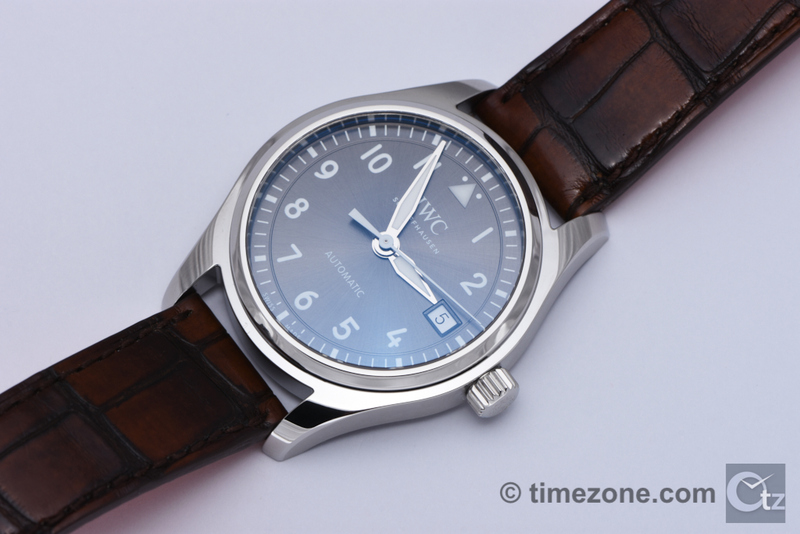 IW510301), the Pilot's Watch Mark XVIII (Ref. 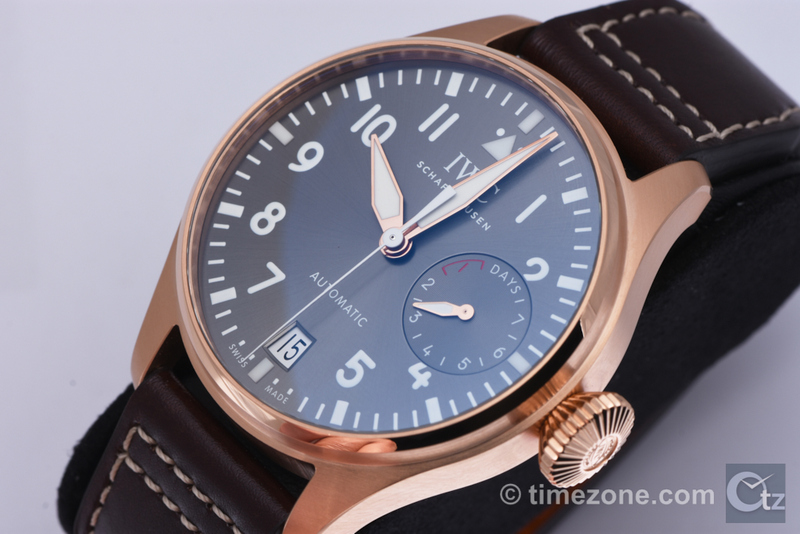 3270) and the new Pilot's Watch Automatic 36 (Ref. 3240). Other SIHH favorites include the new Pilot's Watch Timezoner Chronograph, and the Antoine de Saint Exupéry and Le Petit Prince collections. 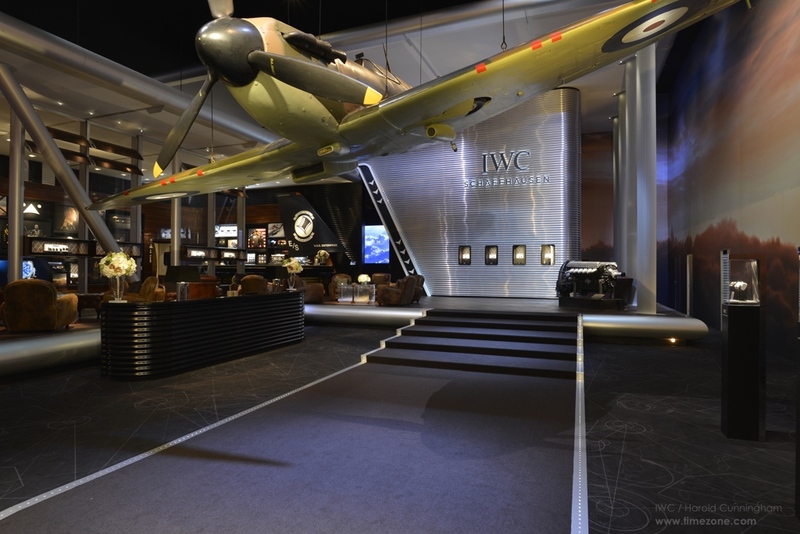 The Big Pilot's Heritage Watch is inspired by the original Big Pilot's watch (Die Grosse Fliegeruhr) on permanent exhibition at the IWC Museum in Schaffhausen, the legendary ref. 431 B-Uhr with pocket watch caliber 52 T.S.C introduced in 1940. With an oversized case diameter of 55 millimetres, the Big Pilot's Heritage Watch 55 is enormous and the size is authentic to the original observer's watch. The BP Heritage Watch 55 houses the caliber 98300 hand-wound pocket watch movement with hacking seconds. Available in a limited edition of just 100 watches, the BP Heritage Watch 55 is aimed squarely at military watch collectors. Price is $14,800. The BP Heritage Watch 48 is limited to 1,000 pieces. 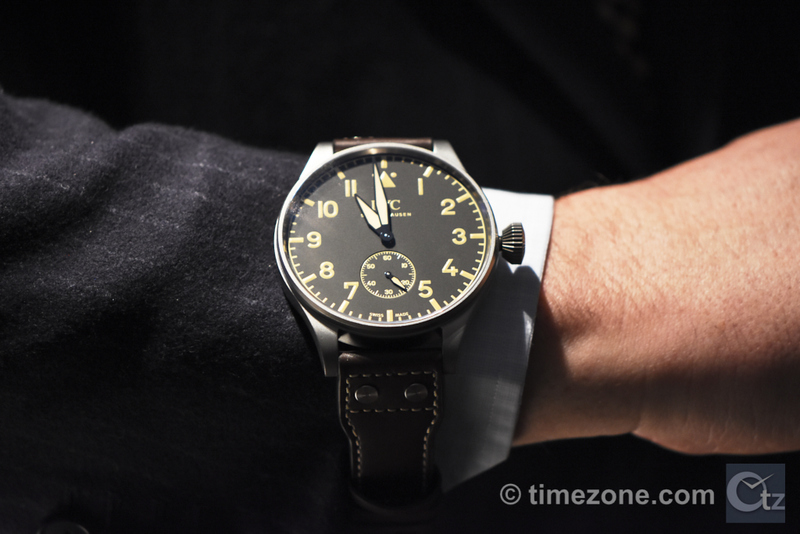 Notably, and missing from any of the SIHH press materials, is that in 1940, IWC supplied the original B-Uhr to the German Luftwaffe in a batch of 1,000 examples. 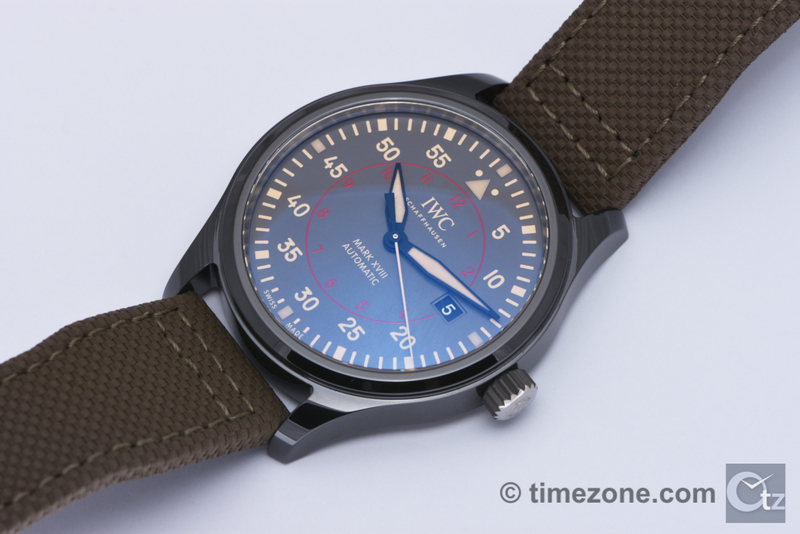 This historical detail is undoubtedly also aimed at military watch collectors. The BP Heritage Watch 48 features a slightly smaller 48 mm sandblasted titanium case, titanium conical crown, titanium buckle and titanium caseback with a peephole to see the power reserve indicator attached to the mainplate. The black dial is inspired by the original Big Pilot from 1940, with heat-blued hands and vintage beige Super-Luminova that simulates the aged look of radium applied on the original hands and dials. 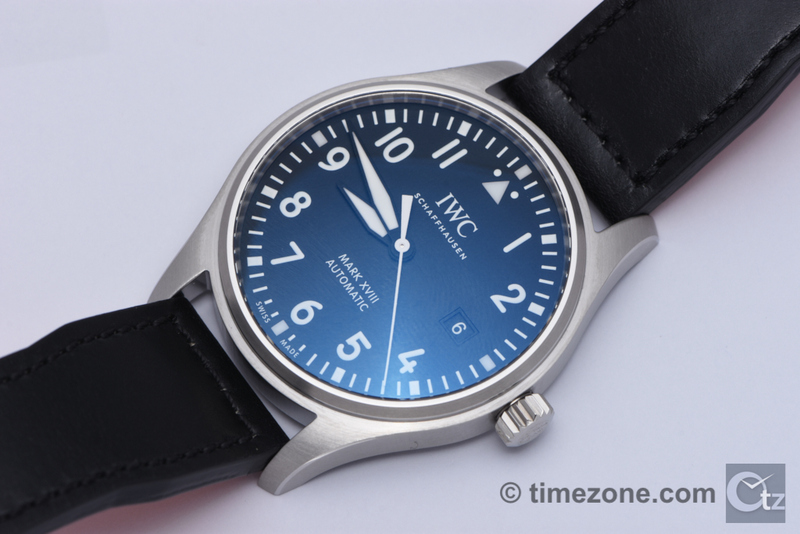 Like the original, IWC fits a hand-wound pocket watch movement in the BP Heritage Watch. 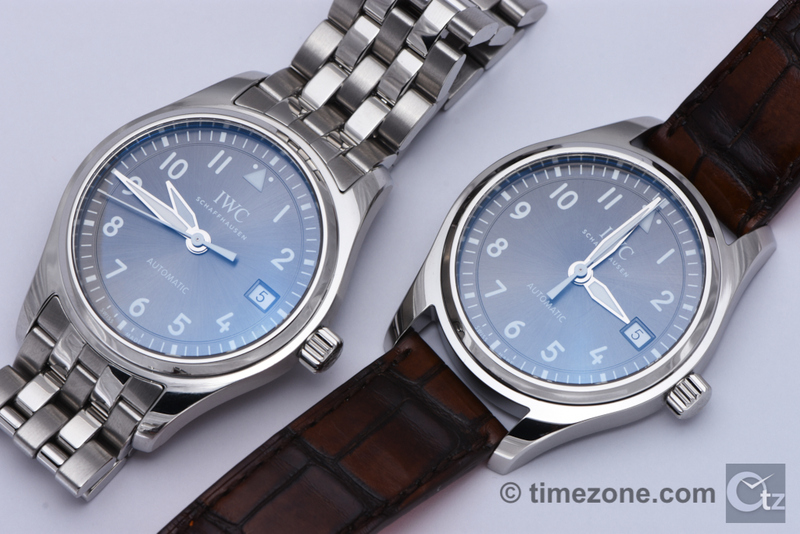 The IWC caliber 59215 is a hand-wound movement with a 192-hour power reserve. Price is $13,400. 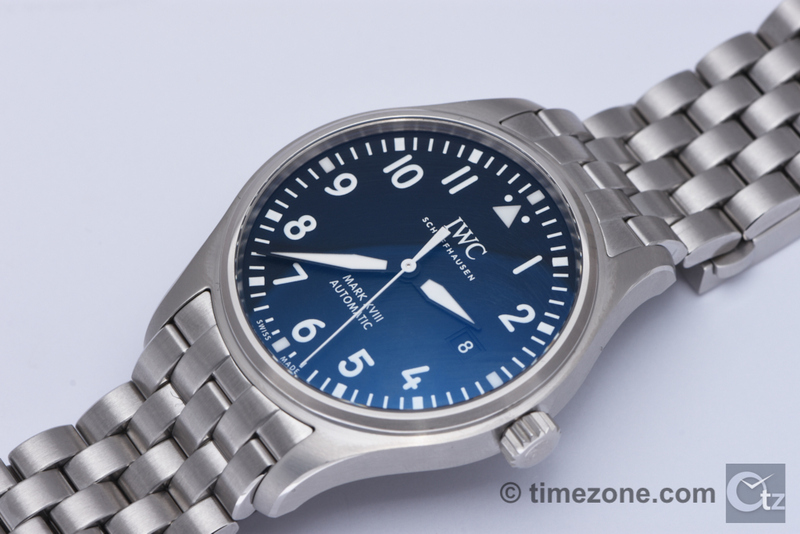 The Big Pilot welcomes back the triangular index to its original position below the chapter ring, and the "9" also returns to its original position on the dial. The Arabic numerals appear a little bolder and the 5-minute markers are slightly slimmer. The Big Pilot houses the manufacture caliber 51111 automatic movement with a spring-mounted rotor and Pellaton pawl-winding system with a 7-day power reserve, protected from magnetic fields within a soft-iron inner cage. The 46mm stainless steel case is fitted for the first time with a black calfskin Santoni strap. Price is $12,900. The Big Pilot's Watch Spitfire features an 18-carat red gold case that measures 46mm x 16mm. The slate-colored dial is complemented by 18-carat red gold Alpha hands filled with Super-Luminova. The conical crown, solid caseback and deployant clasp are also crafted in 18-carat red gold. 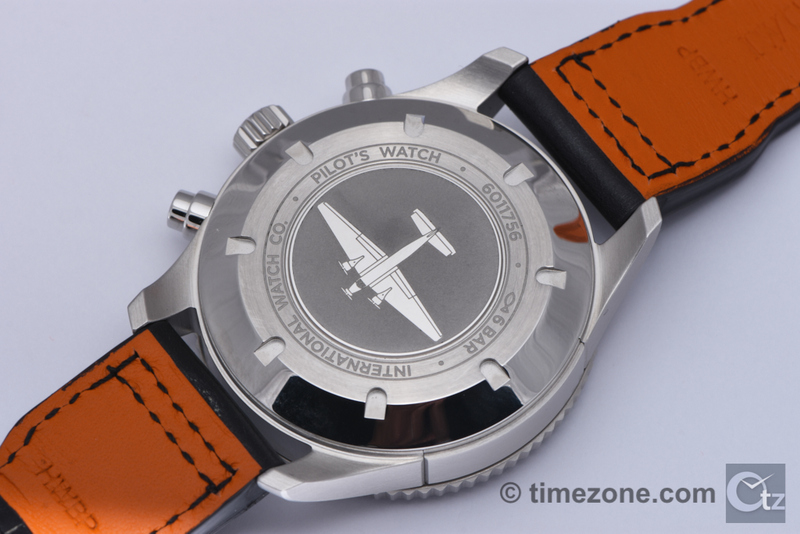 The caseback is engraved with the silhouette of a Spitfire British fighter plane. The Big Pilot houses the manufacture caliber 51111 automatic movement with a spring-mounted rotor and Pellaton pawl-winding system with a 7-day power reserve, protected from magnetic fields within a soft-iron inner cage. The timepiece is fitted with a brown calfskin Santoni strap. Taking its straight-forward design cues from the Mark 11, the Mark XVIII sees the return of the "9" on the dial and a single date. The 40mm stainless steel case has a domed sapphire crystal treated with antiglare on both sides, and caliber 30110 automatic movement in a a soft-iron inner cage for protection against magnetic fields. Price is $3,950 on calfskin Santoni strap and $4,950 on stainless steel bracelet with fine-adjustment deployant clasp. 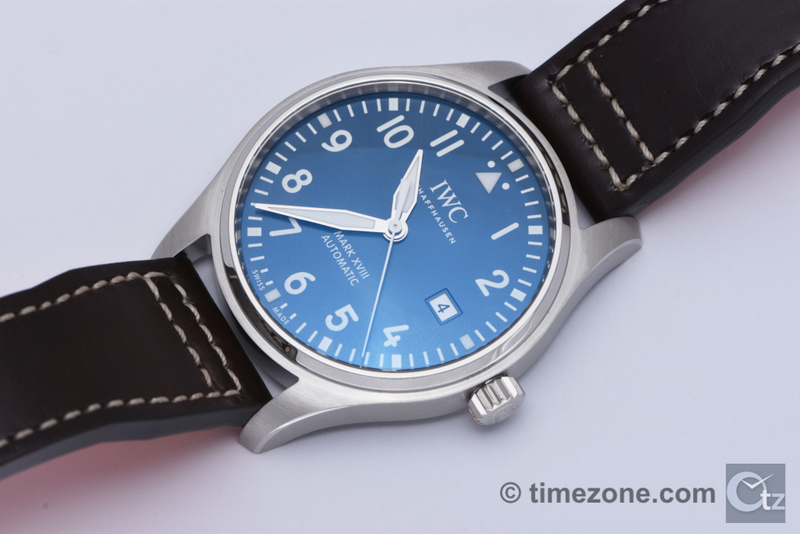 Pilot's Watch Automatic 36 measures just 36mm in diameter and is the smallest watch in the IWC collection. The model houses the caliber 35111 automatic movement in a soft-iron cage for protection against magnetic fields. 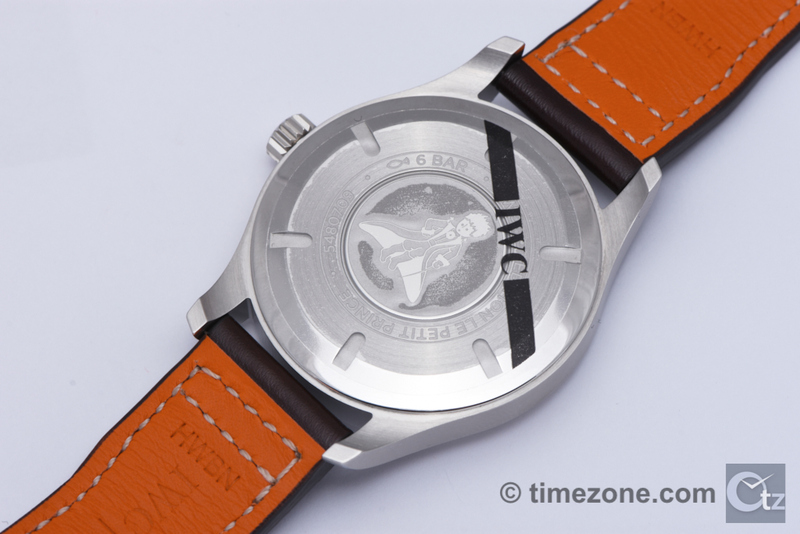 The solid caseback is blank to allow for personalized engravings. 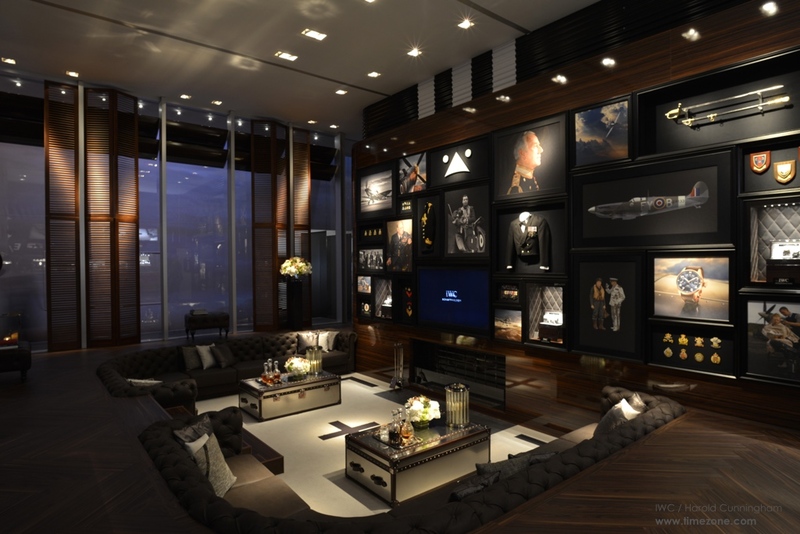 There are five different references with three different dial options available, with prices starting at $3,950. The Pilot's Watch Chronograph dial is cleaner, simpler and now only features a single date. 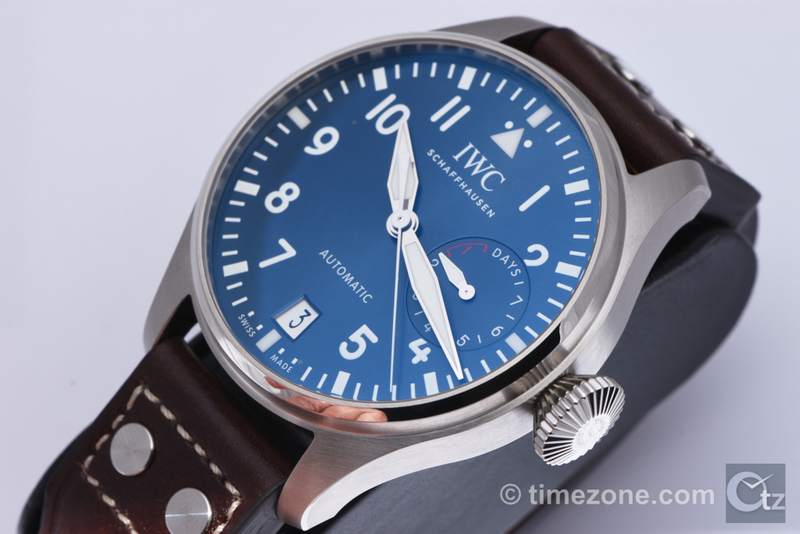 The timepiece features a 43mm stainless steel case with polished and brushed surfaced. The caliber 79320 is protected from magnetic fields by a soft-iron cage. The timepiece is fitted on either a black calfskin strap by Santoni with a stainless steel pin buckle, or newly designed stainless steel bracelet with fine adjustment deployant clasp. The new bracelet has a more three-dimensional look and is finished with polished and brushed links. Price is $4,950 on strap or $5,950 on bracelet. 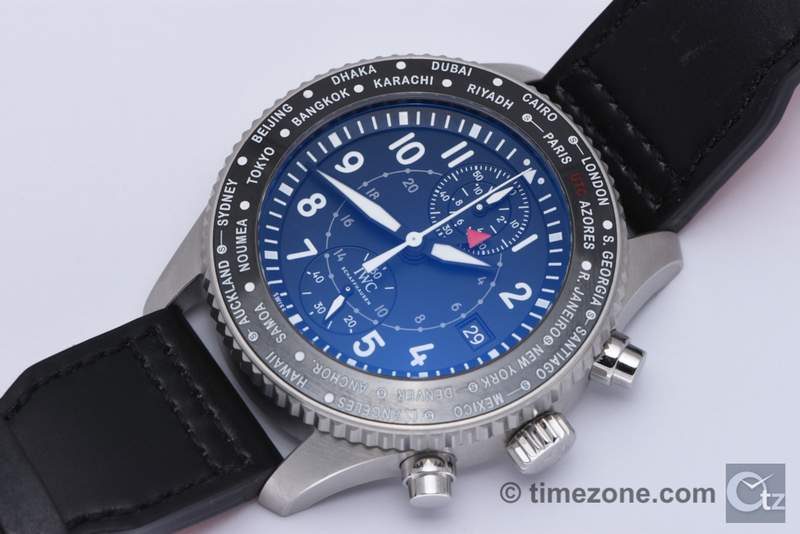 The Pilot's Watch Timezoner Chronograph presents a world timer that can be set using the bezel. The hour hand, 24-hour display and the date also move automatically. The simple operation is both practical and elegant. The 45mm stainless steel case frames a black dial with domed sapphire crystal treated with antiglare on both sides. The IWC Timezoner Chronograph features the new caliber 89760 automatic chronograph world-time movement with 68-hour power reserve. Functions include 24-hour display, date, flyback chronograph with hour and minute counters at 12 o'clock, and small hacking seconds. The black calfskin Santoni strap is particularly well-finished with a soft, orange leather lining and is secured by a deployant clasp. Price is $11,900. The Pilot's Watch Double Chronograph Edition "Antoine de Saint Exupéry" is a limited edition of 1,000 that features an attractive tobacco brown dial, applied Arabic numerals and a brown calfskin Santoni strap with cream top-stitching. Part of the proceeds of every Saint Exupéry sale will be donated to the Antoine de Saint-Exupery Youth Foundation. 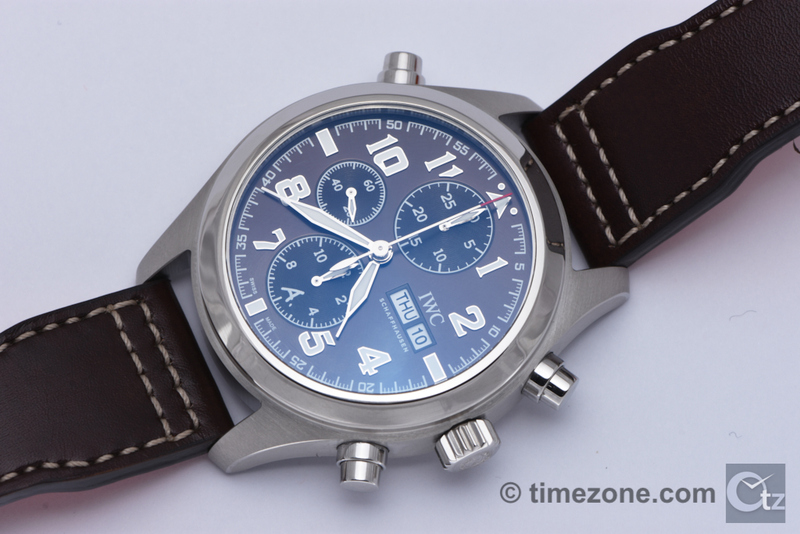 The double chronograph has two hands that start simultaneously. The rattrapante or split-seconds hand can be stopped independently by using the third pusher at 10 o'clock, while the chronograph hand continues to run. This permits the recording of two separate times within any given minute. If the third pusher is pushed again, the split-seconds hand instantaneously catches up and is synchronized with the chronograph hand. It is then possible to record a new lap time or intermediate time. The 44mm stainless steel case is fitted with a domed sapphire crystal treated with antiglare on both sides. The caliber 79420 automatic movement is protected by magnetic fields by a soft-iron cage. Engraved into the solid caseback is a Lockheed P-38 Lightning aircraft that Antoine de Saint-Exupéry took off on 31 July 1944 to make his last reconnaissance flight over the south of France. Price is $11,900. The Big Pilot is now available in an unlimited Le Petit Prince version with midnight blue dial and brown calfskin Santoni strap. 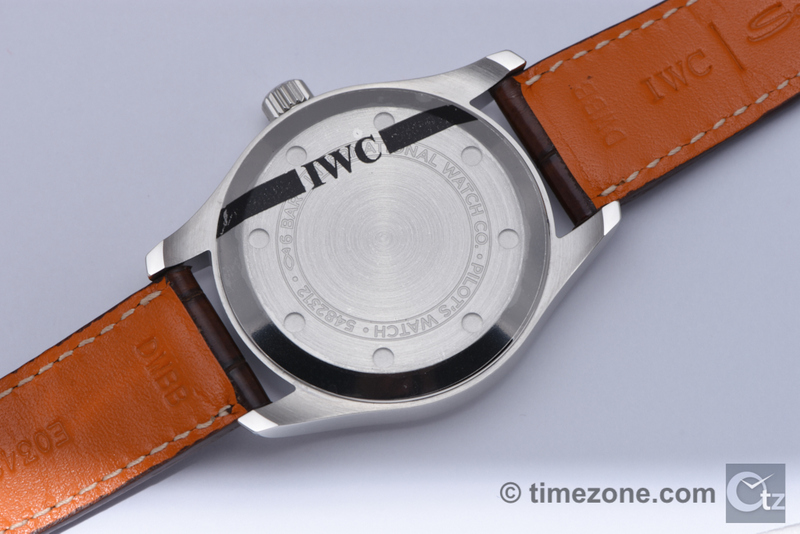 The dial features the triangular index below the chapter ring, and the "9" on the dial. The Arabic numerals appear a little bolder and the 5-minute markers are slightly slimmer. The Big Pilot houses the manufacture caliber 51111 automatic movement with a spring-mounted rotor and Pellaton pawl-winding system with a 7-day power reserve, protected from magnetic fields within a soft-iron inner cage. The 46mm stainless steel case is water resistant to 6 bar. Price TBD. The Pilot's Watch Mark XVIII Le Petit Prince features a 40mm polished stainless steel case with a soft-iron inner case for protection against magnetic fields. The domed sapphire crystal is treated with antiglare on both sides, over a midnight blue dial. Caliber 30110 automatic movement. The brown calfskin Santoni strap with contrast top-stitching is fitted with a pin buckle. Price TBD. 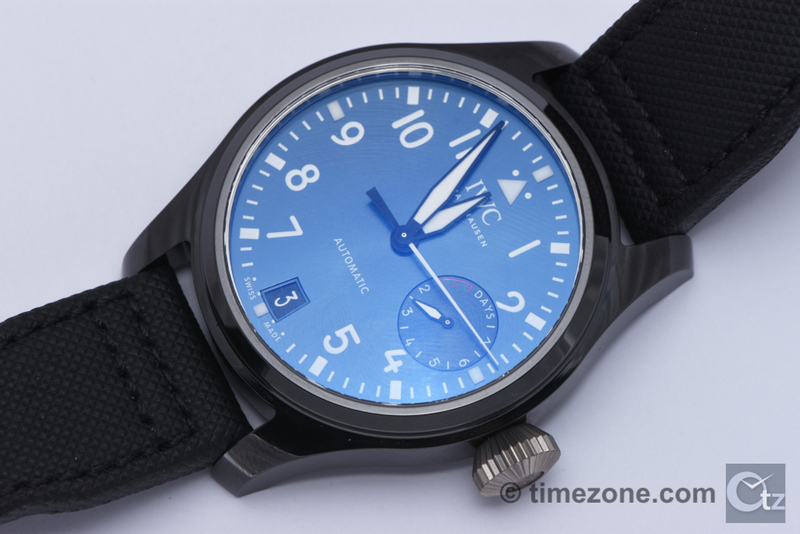 The Pilot's Watch Mark XVIII TOP GUN Miramar features a 41mm polished ceramic case. The ceramic case is combined with titanium elements, like the titanium crown and titanium caseback. The domed sapphire crystal is treated with antiglare on both sides for an unobstructed view of the distinctive anthracite dial with beige and red print. The caliber 30110 automatic movement is protected from magnetic fields within a soft-iron inner cage. The embossed green calfskin Santoni strap is secured by a titanium pin buckle. Price is $5,400. The Pilot's Watch Chronograph TOP GUN features a 44mm ceramic case, black dial with crisp white print, and black embossed calfskin strap with a sandblasted stainless steel deployant clasp. The timepiece houses the caliber 89361 automatic flyback chronograph movement with 68-hour power reserve, protected from magnetic fields within a soft-iron inner cage. Price is $10,900. The Big Pilot's Watch TOP GUN is the TOP GUN version of the Big Pilot that features a matte black ceramic case, matte black dial and black calfskin strap (embossed) with a blasted stainless steel deployant clasp. The ceramic case is combined with titanium elements, like the titanium crown and solid titanium caseback engraved with the TOP GUN logo. The Big Pilot houses the manufacture caliber 51111 automatic movement with a spring-mounted rotor and Pellaton pawl-winding system with a 7-day power reserve, protected from magnetic fields within a soft-iron inner cage. Price is $13,800. Next Topic: IW502119 BOX . WOOD OR PLASTIC ?